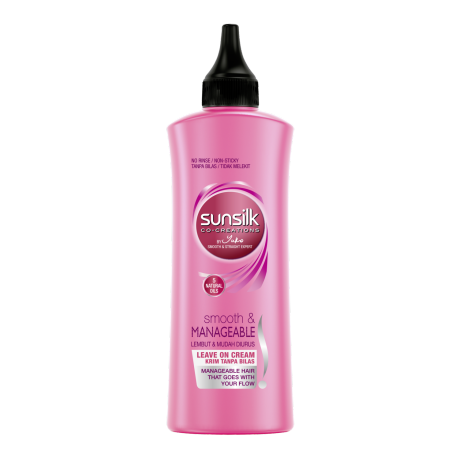 Sunsilk Leave On Cream helps you style and restyle your hair anytime, anywhere. Used on damp or dry hair, its Hydra Lock Technology™ injects moisture into your hair giving it natural "weight" that reduces frizz and easily styles, so you have your hair always on your side. It injects moisture into your hair giving it natural "weight" and making it less frizzy. It also helps you style and restyle your hair anytime, anywhere. Apply on damp hair or on dry hair as a touch up during the day. 1. Start with a small coin-sized amount on your palm. 2. Rub it on your hands evenly. 3. Apply it from the middle to the tips of your hair. 4. Use comb or fingers to style your hair naturally. Use more product as needed. For best results, use with Sunsilk Smooth & Manageable range.